The United States Air Force Thunderbirds conduct a flyover of Super 51 at NRG Stadium in Houston, Texas back in 2017. The United States Air Force Thunderbirds are set to kick off Super Bowl 53 in Atlanta on Sunday, February 3 with a flyover during the National Anthem. 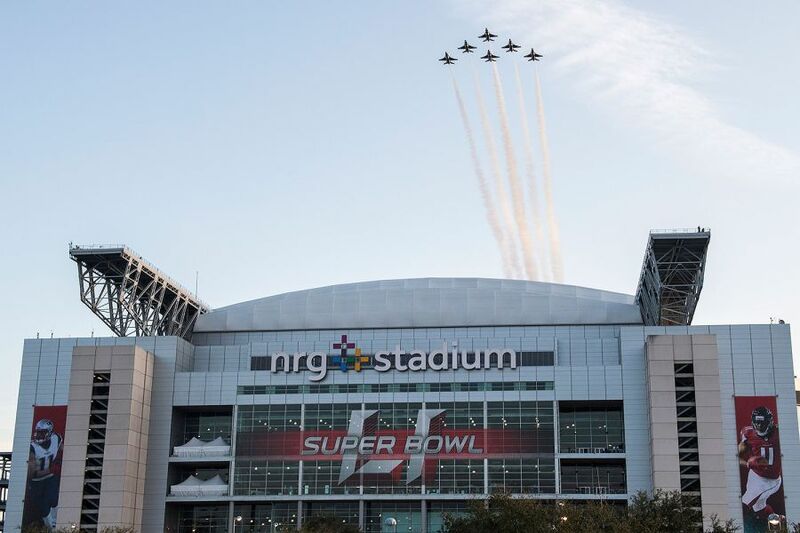 The Thunderbirds last conducted a Super Bowl flyover back in 2017, when the Atlanta Falcons played the New England Patriots at NRG Stadium in Houston, Texas. However, weather conditions forced the NFL to close the retractable roof to the stadium, and so the team’s signature Delta formation was seen only on TV and by those outside the stadium. The same scenario is possible in Atlanta, with a retractable roof protecting the inside of the new Mercedes-Benz Stadium. The NFL has stated they want the roof open during the big game, but weather will dictate whether that will actually happen or not. Regardless, the 2019 Thunderbirds plan to make their first cross-country trip of the year as they travel from Nellis AFB in Las Vegas, Nevada to Dobbins ARB in Marietta, Georgia. Dobbins ARB is just north of Atlanta and Mercedes-Benz Stadium, and will host the team for the flyover and again in October for the Atlanta Air Show, held at the Atlanta Motor Speedway in Hampton, Georgia. Dobbins has hosted the Thunderbirds twice over the last several years, when the team made appearances at Wings Over North Georgia in Rome, Georgia. The team is expected to arrive on Friday, February 1 at Dobbins ARB, and will conduct a site survey over Mercedes-Benz Stadium on Saturday, February 2 in preparation for Sunday night’s big game. The site survey will allow the team to successfully plan and coordinate a specific TOT, or time over target, so that the six red, white, and blue F-16’s scream overhead at the perfect time, typically towards the end of the National Anthem. The United States Air Force Thunderbirds conduct a practice flyover above NRG Stadium in Houston, Texas, prior to Super Bowl 51. Once the team takes off from Dobbins ARB on Sunday afternoon and begins flying towards Mercedes-Benz Stadium in Atlanta, they can only speed up or slow down their arrival by about 10 seconds. Thunderbird 8, Major Jason Markzon, is the team’s new Advance Pilot and Narrator. He will be inside Mercedes-Benz Stadium on Sunday to coordinate the flyover. For each stanza of the National Anthem, there is a specific time and distance for where the six F-16’s should be, and he will be on the radio with Lt. Col. John Caldwell, Thunderbird 1, providing updates and coordinating with the Delta formation for an on-time arrival over the stadium. As we get closer to Super Bowl Sunday, stay tuned to our website, social media, and mobile app for the latest updates on the Thunderbirds’ trip to Atlanta! Mercedes-Benz Stadium, host of Super Bowl 53.